–> Jam technology hasn’t evolved much since your great-grandma’s days. Still, that doesn’t mean new designs of those old tools wouldn’t leave her envious. (1) MAUVIEL’s preserving pan ($230, mauvielusa.com) is case in point. 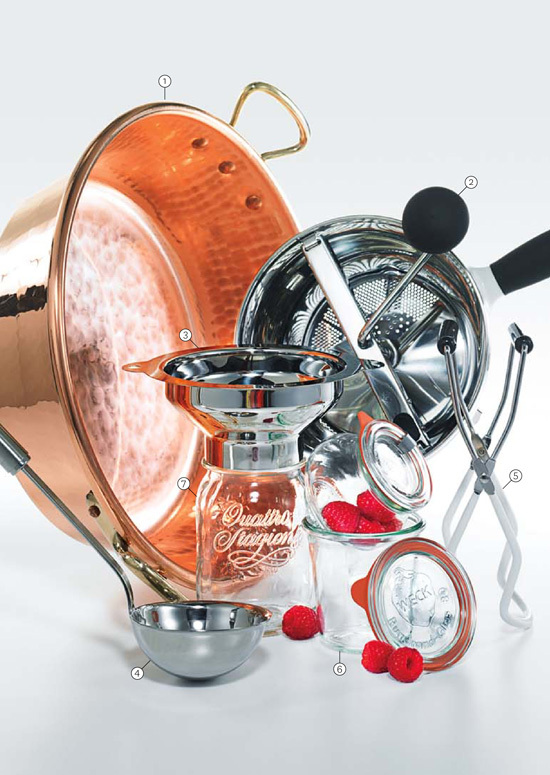 The Normandy, France — based company has been casting kitchenware since 1830, and its broad copper pan conducts heat evenly to keep your berries from burning. The interchangeable blades and strainers on (2) OXO‘s food mill ($50, oxo.com) give fruit a refined, hand-pureed texture that a Cuisinart can’t approach. Canning can be an unwieldy business, but (3) RSVP INTERNATIONAL ‘s wide-mouth funne ($14, amazon.com) perches neatly atop jars and (4) RöSLE‘s stainless-steel ladle ($37, rosleusa.com) has a sleek, round pouring rim that prevents jam spillage. (5) FOX RUN ‘s jar lifters ($8, acehardware.com) pluck the sealed jars from boiling water without looking like an eyesore in the kitchen. And for showing off the fruits of your labor? We suggest (6) WECK‘s Deco and Mold jars ($14 for six, weckcanning.com), beloved by jam geeks for their minimal look and foolproof rubber gasket, or Italian-made (7) BORMIOLI ROCCO‘s Quattro Stagioni jars ($2.50, surlatable.com) with traditional twist-on lids.